Last night's episode of Project Runway was my favorite of the season. This is for one reason and one reason only--Tim Gunn. 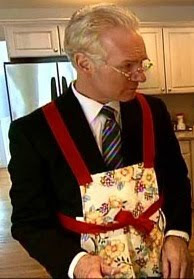 Look at him in his apron while visiting Carol Hannah and family for a home-cooked southern meal. Isn't he cute? Don't you just want your own personal Tim Gunn? Anyway, last we saw them, Carol Hannah, Irina and Althea were sent their separate ways with $9000 and a few months to create a twelve piece collection for Bryant Park. 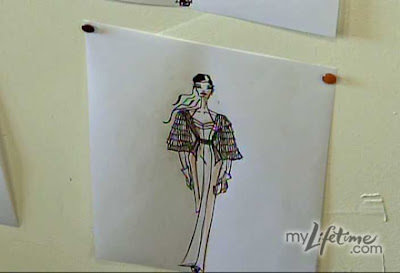 This episode focused mainly on Tim's home visits to check each designer's progress and to help guide them on their way. He started with Carol Hannah who moved to Huntington. On her way there from South Carolina she stopped at Duke University where she was inspired by the architecture and cool lighting. I'm not sure how she decided to go for a collection full of whimsy from architecture, but that's what she did. Tim mostly like the collection, except for a matronly capelet. After this, Carol Hannah invited Tim to eat a good southern meal with her family, but he'd have to help (see above picture). While at the table Carol revealed that she had been an awkward kid and had taught herself to design. Her grandmother was a seamstress, and Carol Hannah would spend hours watching her work. She learned to make doll clothes and gained confidence by sewing clothes for herself. Tim left her with the parting thoughts that he liked her collection but she should be careful not to over think and add too much that would take away the elegance of the collection. 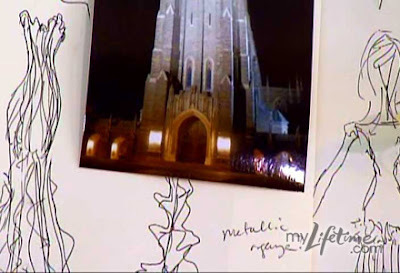 Next up, Tim headed to Irina's New York City apartment to check on her collection. Irina, inspired by her childhood in Coney Island, decided to make her collection a a tribute to the city. She incorporated print t-shirts with scenes from Coney Island to mix with her elegant, high end collection. The effect seemed like it could turn out quite cool. She also created some stunning knits, which I would like to own. When meeting with her friend and family at Irina's favorite restaurant, Tim got a little insight into Irina's struggle to become a designer. Irina's mother has always supported her dream. Irina's father has not been so supportive. She hopes winning project runway will show him she can make it and earn approval. This brings out a whole new side to Irina and her determination to win. Tim then moved on to Dayton, OH to see Althea. She stayed close to home to create her collection. Althea took her inspiration from strong women in Sci-fi movies, which I'm not sure showed. She also had some great knits (uh-oh, Irina will think you copied...), but Tim warned her not to wander in to costume territory with her designs. "Edit. Edit. Edit." he said. During dinner with her family, we learned that Althea had wanted to be an artist as a child. She loved to draw people and enjoyed drawing their clothes. This started her into designing. In high school she would just whip up a shirt for her sister if she had nothing to wear. Irina did have one little hiccup. The images for her Coney Island shirts were trademarked so she had to recreate her own version. It looks like they came out nice though. After all this, they met up in New York to prepare for fashion week. Carol Hannah was delayed because he had a stomach flu, but she pushed through (with a few tears). The designers cast their models (blah, blah, blah boring part) and and got a visit from Michael and Nina for a pep talk. Once the pep talk was through, Heidi came in with Tim to crush all hopes and dreams by telling the designer they had one last surprise. This is never a surprise. There is always one last look to be made right before fashion week. It happens every season. Why does everyone always look surprised by this. Why don't the designer create a design for one more piece in anticipation of this. Why do they complain? Why do they looked shocked? (Well, the producers probably told them to do that). Of course, Tim would never really crush dreams. The last three designers kicked off were brought back for help. Althea chose Logan (sorry Carol Hannah), Irina chose Gordana (which is a crazy advantage since Gordana is great at finishing things) and Carol Hannah got Christopher (but seemed very pleased). We'll have to wait until next week to see how these final outfits turn out and if any fights broke out between the pairings. I do believe that Irina & Gordana are the best pairing. I hope having two self-taught designers in a pair won't hurt Carol Hannah's final look. I find it odd that Althea chose Logan even though she was so mad about him copying her zipper collar. Of course, this may have been a good move because if you have a person helping you make a garment, it is helpful to have someone who can emulate your style. I'm not sure who will triumph. I'm leaning toward Irina, but Carol Hannah might have something. I feel a little disappointed with Althea's collection, but I haven't had a close enough look at it to be sure. Fun fact: the real Mood has a dog named Swatch! How awesome is that? I totally geeked out when they mentioned Swatch the dog. Cutest thing ever. I don't know, I think I'm rooting for Carol Hannah at this point. Tim Gunn has never been so informal and goofy, and I love it! I do want my very own Tim Gunn! He's adorable. I really like both Althea and Carol Hannah, but will be surprised if Irina doesn't win. I really think she's the best designer and seamstress.